Observers outside of Papua New Guinea may find it a somewhat puzzling exercise to try to pinpoint PNG’s position on the current geopolitical manoeuvrings between the United States (and its allies) and China. What factors define PNG’s interactions with the various parties in this rivalry? The crudest way of answering that question is: PNG’s foreign relations have to be understood in the context of PNG’s domestic politics and the perceived benefits of those relations. On the whole, PNG’s foreign relations are not informed by any rigorous process of foreign policy engagement with domestic stakeholders and interest groups. What is touted as PNG’s interest isn’t necessarily the product of a serious refining of priorities. PNG’s official foreign relations are determined mainly by personalities and circumstances or perceived material benefits, rather than by any distinctive decision-making structure. Cabinet and ministerial prerogative in most instances frames how foreign policy agendas are executed on behalf of the Independent State of PNG. References to cornerstone foreign policy ‘principles’ are made, but often as an afterthought. Domestic players, if they exist at all, are disconnected from the foreign-policymaking process. The latest move to build a naval facility with Australia in Manus province provides a good example. It is the first time since independence that a facility housing foreign powers will be constructed in PNG. The agreement to have a joint naval base on PNG territory faces a ‘democratic deficit’ because Papua New Guinean input was never sought, yet it is Papua New Guineans who will live with the impact. Allan Gyngell and Michael Wesley note  that ‘foreign policy making is a realm of government that needs to be subjected to a greater amount of public accountability and transparency’. The Manus naval base agreement is a foreign policy strategy that doesn’t reflect Papua New Guinean designs. Already, there are objections to the decision by political leaders of Manus, who feel that the province’s people weren’t consulted on the matter. The PNG government’s decision to be party to a joint naval base agreement was never debated in parliament, even though that is the highest law-making body in the land with the power to ratify international treaties and agreements. The parliamentary committee on foreign affairs is ineffectual and has never been allowed to consider submissions from the public on issues such as the naval base. Two previous Australia–PNG cooperation arrangements—the 2004 enhanced cooperation program and the 2013 deal to process asylum seekers on Manus Island—were belatedly ruled unconstitutional by the PNG Supreme Court. Australian engagements with PNG have an unsavoury history of bypassing initial domestic scrutiny. The fact that these landmark bilateral arrangements were found to be unconstitutional attests to deficiencies in domestic scrutiny and debate. Checks and balances on national positions in PNG’s international commitments are dispensed with. It is an efficient way of keeping Papua New Guineans passive and reliant on external forces and the all-knowing executive arm of government. 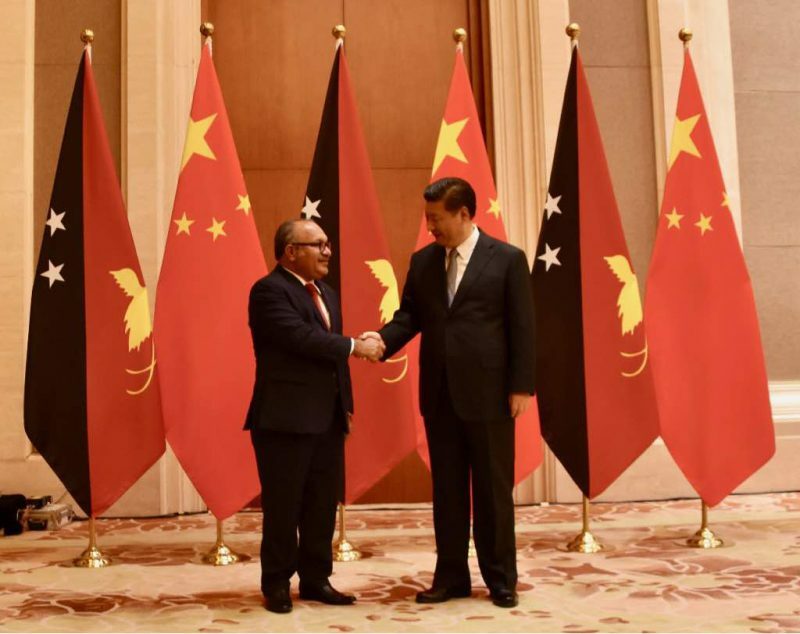 I am tempted to argue that the competing powers in the Sino-American rivalry are capitalising on the weaknesses in PNG’s domestic scrutiny of foreign policy and an uninformed populace to advance their own agendas. Without the input and constructive participation of Papua New Guineans, our country’s position on international matters will further erode democratic processes and ultimately the sovereignty of PNG. If PNG’s partners are serious about helping us build on our common values of adherence to the rule of law and democratic principles in decision-making, the same level of participation that American and Australian citizens enjoy has to be encouraged for PNG. This may mean demanding that the PNG government show cause on the level of domestic input into a serious issue like a naval base on PNG territory. The US and Australia should make adequate consultation with the people of PNG a condition for agreements on issues that will profoundly affect them. In Western democracies like Australia and the US, foreign policy is an outcome of a range of alternatives, and the participation and influence of domestic interest groups and actors is pronounced. In Australia, for instance, the media is an agenda-setting stakeholder. Non-government organisations; advocacy and lobby groups; political parties; research think tanks wholly committed to informing foreign-policy positions; and a multiplicity of interest groups and individuals make the process of foreign-policymaking a rigorous and sometimes protracted affair. Moreover, foreign policy is a serious item in the electoral cycle, not least when it comes to decisions like whether or not to go to war. It’s not unheard of for political parties and candidates to either win or lose based on the foreign policy platforms they align with. Voters in industrialised democracies are often also tax-paying citizens. Taxpayers invariably vote with the assumption that their tax dollars will be spent on policies and programs that are consistent with their interests. In foreign relations, taxpayers prefer certain levels of accountability. The Australian and New Zealand governments, for example, are exacting when it comes to reassuring taxpayers about the quality and transparent delivery of their foreign aid to countries like PNG. It is these processes and institutions in Western democracies that directly connect the citizen to foreign-policymaking processes, and make foreign policy relevant to the average citizen. It is therefore misleading to assume that the same kind of connection of the citizenry to the foreign policy apparatus exists in developing democracies like PNG. PNG’s parliament is dominated by the executive. In a political system where elected officials are focused on more parochial and tribal matters and concerned with the immediate chores of pork-barrel politics, foreign relations is a sideshow preoccupation over which the cabinet, the prime minister and the Ministry of Foreign Affairs have significant influence. Western powers in the region that wish to enlist the diplomatic support of PNG in countering non-democratic powers ought to be mindful of the domestic dynamics of PNG’s foreign policy decision-making processes, to help nurture inclusive values. Western countries that are governed according to democratic principles should look no further than their own political systems and the standards to which their citizens and interest groups hold their elected leaders. Patrick Kaiku is a teaching fellow in the political science department at the University of Papua New Guinea. Image courtesy of Prime Minister’s Office PNG on Facebook.